Mine: A great film. There are at least 15 important charatcers and they are all well written and well acted. A powerful, sometimes funny, ultimatley dipressing film. Leonard Maltin/Plot synopsis: Idealized, individualistic look at life in the black community of Bedford-Stuyvesant in Brooklyn, where a white-owned pizza parlor flourishes... and where circumstance leads to an outbreak of hostilities on a sweltering summer day. Entertaining and provocative, with a much-discussed (and troubling) finale. Writer-director Lee also stars as Mookie, the delivery boy; his real-life sister Joie plays his sister in the film. 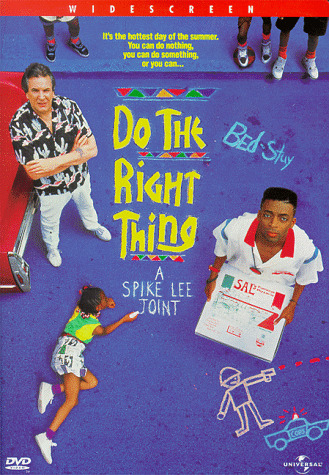 (out of 5 stars) 1989's Do The Right Thing Is My Spike Lee Film.